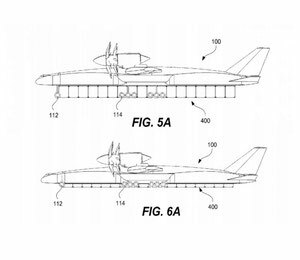 It seems a far-fetched idea, but one which Boeing is seemingly taking seriously and they have even taken out a patent on their latest future freighter study. 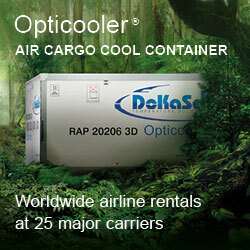 A plane, which sits down onto freight containers, much like a mother hen onto her eggs! Normal sea or air freight containers are cube or box-like shaped and freighter manufacturers have previously have had to contend with fitting cube shapes into round (hull) holes. This might all be different in the not too distant future as Boeing has implemented (and patented) a study of a new plane design which could change all this. In other words - instead of putting cargo containers into a circular hull - the containers would be lined up in a row and the (mother hen) aircraft would lower or roll her body over them. The illustrations here (courtesy of Boeing & Popular Science) show that the aircraft design would allow for a very wide spacing of the landing gear so that it could basically roll over the containers and lift and fix them into the structure. Nobody would have believed a hundred years ago that we’d be flying aircraft which could carry up to 800 people over long distances and at high speeds. The same goes for freighters. Unknown as wide bodies until the early eighties, but now commonplace and more efficient than ever. An interesting idea as the aircraft is so designed that it would not fly at an altitude of more than 18.000 feet so that the cargo container compartment would not have to be pressurized. It’s not a design which will cater for urgent, sensitive or perishable cargo shipments which need to be carried quickly from one end of the world to another. Boeing apparently sees, or hopes, that there is a market for this giant flying hen for what they term as a cost-efficient way of carrying low-priority bulk cargo which is presently being sent by sea or rail over long distances. A warning for ocean carriers and the upcoming overland train development? If this idea were to “take-off” with an aircraft which can carry large volumes over long distances at a fraction of the cost involved today in air freight carriage - then an aircraft of this design could deliver relatively quickly at prices which would certainly make ocean or overland shippers sit up and take notice. It’s only a design plan at present, but Boeing company has not been one which idles around. This type of Freighter aircraft would open up the vast Northern Territories of Australia and allow the time sensitive products (fruit fresh fish meat) to be moved to the Australian Eastern States and to the growing market in Asia. Grenville, good to see that you are still on the ball in Aussie. Maybe you can convince Canberra to speed up the process. 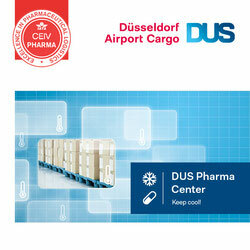 It seems to be a viable innovation for the future cargo development. Wait & See.